Are you crazy about your horse(s)? Do you enjoy wearing fashion-forward products that express the love you feel for your furry Kids? If you answered yes, you'll love our brand-new line of Silicone "Conversation Bandz™"! Our “My Lil’ Star” bracelet design features our signature horseshoes and is complemented with stars to let the world know who “Your Lil’ Star” is! 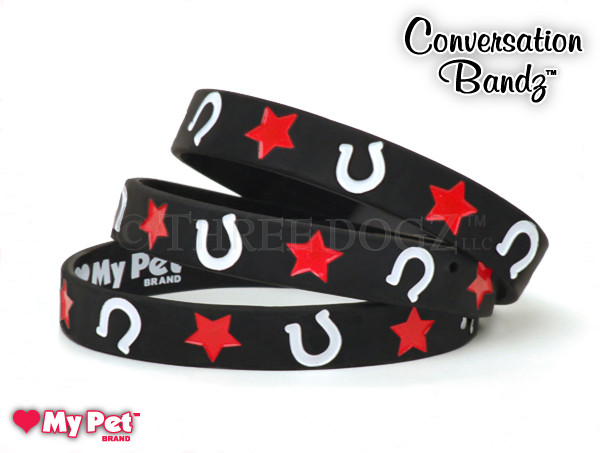 These precision cut/ink filled Conversation Bandz™ become natural magnets to other devoted horse lovers, and will help you strike up a meaningful conversation on a subject that is so near and dear to all of our hearts... our horse(s)! Order yours today…you’ll be glad you did! Click here to see more silicone bracelet designs. $4.95 per bracelet or...mix and match any 3 bracelets of your choice and receive our special bonus pricing of 3 for $10 and share em' with your friends!